So this weekend while at Farm and Fleet (for those not in the upper midwest- it's a store that sells everything from tires, to jeans, to frying pans, to calf milk replacer) with my husband, I found a portable greenhouse. 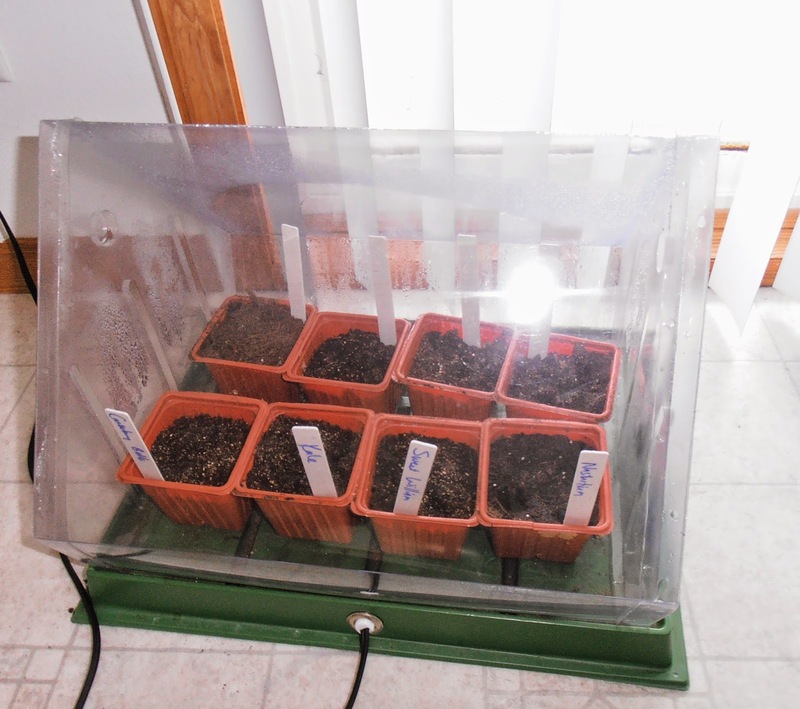 It has four levels and a plastic cover- perfect to start seedling in. I saw a similar one on Amazon for $45, but I'm cheap so I didn't get it. Farm and Fleet's was $20 so I snatched it up. Sunday morning I assembled it (super easy- no tools needed) and even thought about moving it on to the patio, but held off because it wasn't super warm out. Monday I get up and notice a fine dusting of snow on every inch of grass and sidewalk. Yuck. 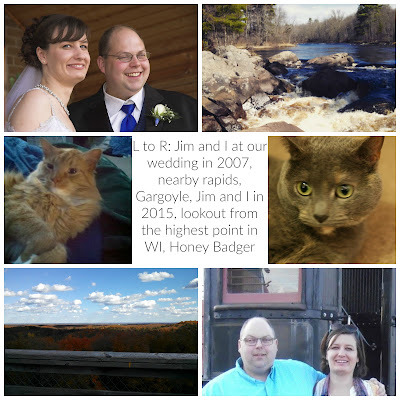 That's Wisconsin springs for you. 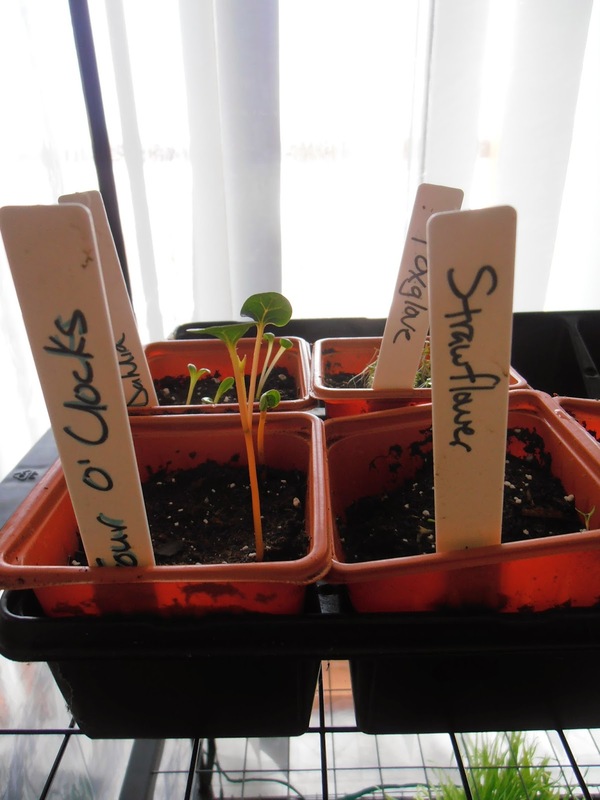 I have (optimistically) started seeds though and their coming up nicely. I planted more today too, now that I have a cat proof area to grow them. And I figured as long as I was showing pictures I'd share some tips for any newbie flower starters out there. 1. Tackle something easy first. I have dreams of growing Hollyhock and Foxgloves and having my own English garden all started from seed, but I lean towards the more realistic. Some seeds are easier to grow into adults than others. I've had the best luck with zinnias- these come in all sorts of sizes and color schemes, nasturtiums- you can eat these, morning glories- but you have to have a trellis or area for these to climb, or marigolds- if you are feeling nostalgic for the rock star five year old version of you who planted these in a styrofoam cup at school for you mom. And if flowers aren't your thing, I always seem to have great luck growing basil, chives, and parsley. As for veggies- salad greens, spinach, cucumbers, zucchini, radish, and kale are pretty easy to grow. 2. Don't dump water onto seedling. You'll crush the pour little things (or drown them). I mist mine with a spray bottle to keep the soil slightly moist. you could also water them from below by added water to your tray and then setting your little containers back into the tray, but I prefer misting. 3. Make sure your plants get plenty of light. I don't have a nice east facing window, so I set mine in the largest window I have which faces the north, but it seems to work okay. 4. Be sure to harden your flower babies off before tossing them outside. You need to take them outside for a little while each day for a week or two before planting so they get used to wind and outdoor temps. I start by putting mine directly against the house in a protected spot and gradually spread them out. 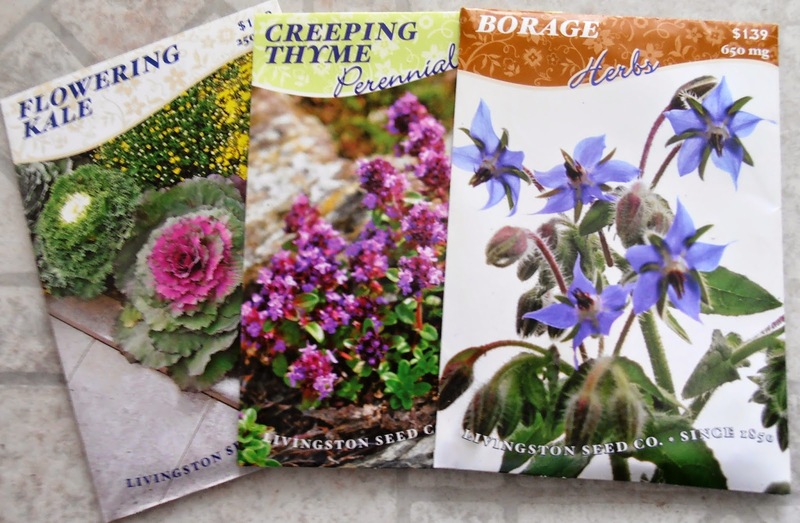 Flowering kale, creeping thyme, and borage are all new things I'm trying this year. 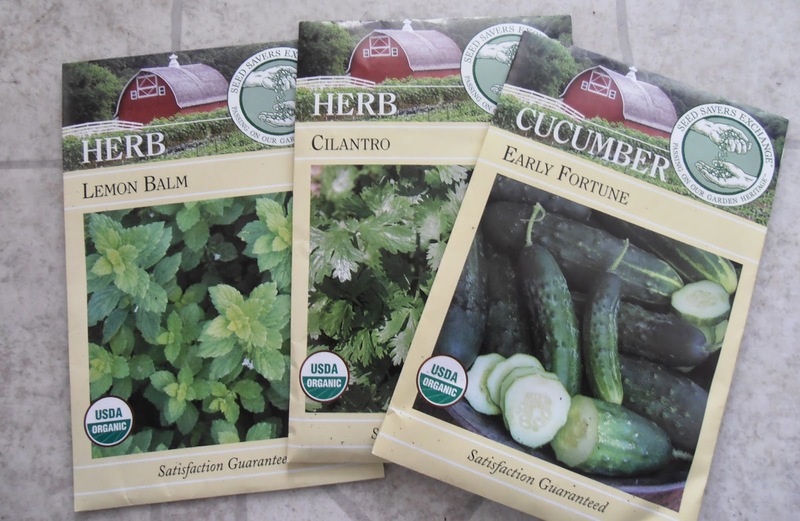 I buy my seeds wherever I find things I like. I got these new guys (shown above) at Farm and Fleet, but I also got some from the hardware store, dollar store, and natural grocery store. I have just as good of luck with seeds that are 5 for a $1 as with the ones that are $1.99 a pack. So don't think you need to spend a lot of money on your seeds to make a go of it. Organic seed from the natural grocery store. As I mentioned before, cat proof growing areas are necessary at my home because HB is a menace and loves to dig in dirt. 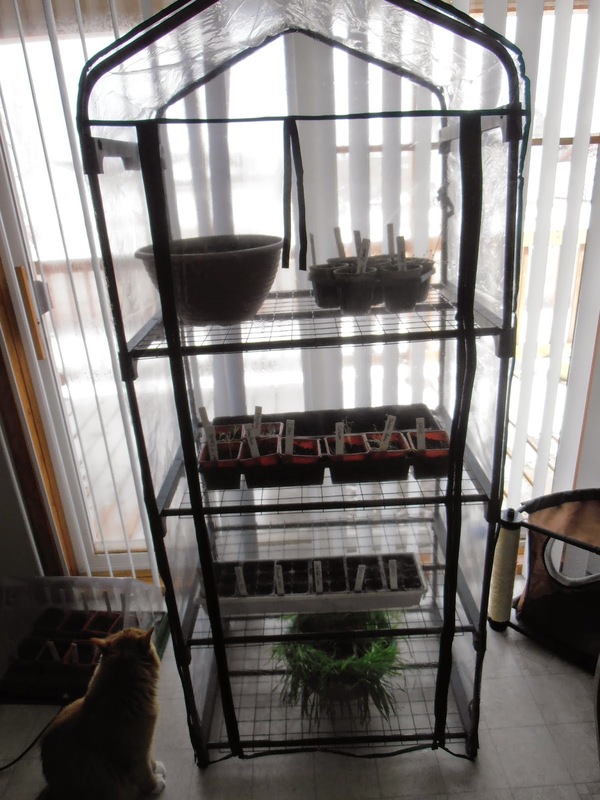 The new greenhouse works great, but I also have a table top greenhouse that plugs in so that your seeds have a warm environment to grow in. Mine is not on my table, but does great in front of a window. Here's a picture of HB contemplating how to get the cat grass from the bottom shelf of the greenhouse. And finally, remember, if you have horrid luck and your cat destroys your seedlings, or you forget to water them for a week and they die, there's always greenhouses to buy plants from.